AVI format is a widely used video format all around the world, and MPEG is also a video format which becomes more and more popular nowadays. As AVI file can’t be played on all the video players, so people may want to convert AVI to MPEG for playback on their video players. MPEG format stand for Moving picture experts group. This group has developed many versions of MPEG format such as MPEG 1, MPEG 2 etc. Now let’s see how you can convert the AVI format to the MPEG format. 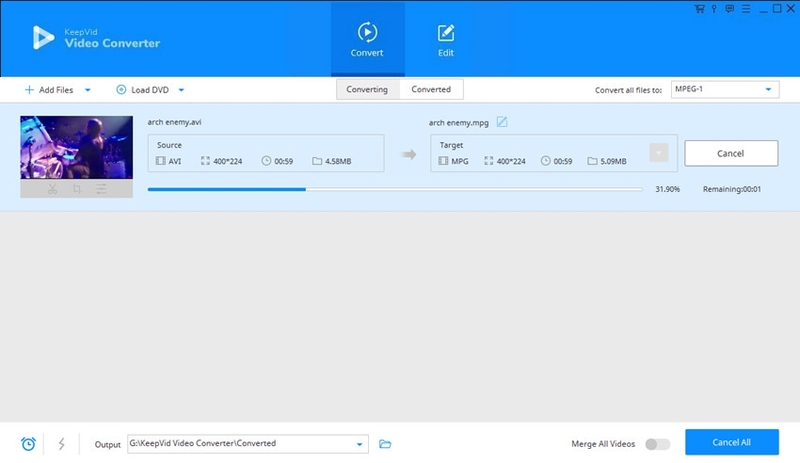 If you want to convert AVI to MPEG, KeepVid Video Converter will be your best choice, which enables you to convert videos to more than 1000 video and audio formats on Windows and Mac computers. This program provides you many helpful features, and it enables you to convert videos with few clicks. The program also provides you other helpful features besides converting videos. This software comes with bundle of features to make your video life easier. 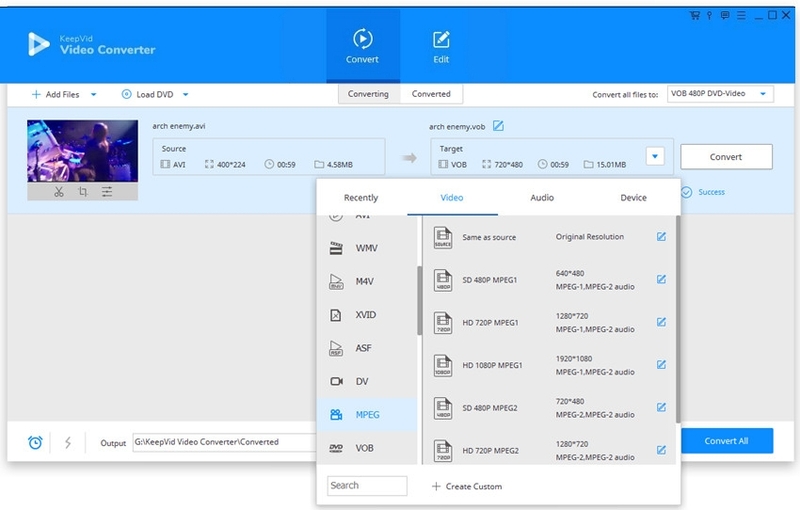 In this part, we’re going to introduce you the key features of KeepVid Video Converter, and how to use it convert AVI to MPEG. 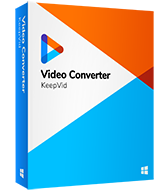 KeepVid Video Converter enables you to convert videos to more than 1000 video and audio formats. This program allows you to convert videos for your devices, such as Android, iOS and so on. It provides you a high-speed conversion feature, and you’re able to convert videos with 30x faster speed. Step 1. 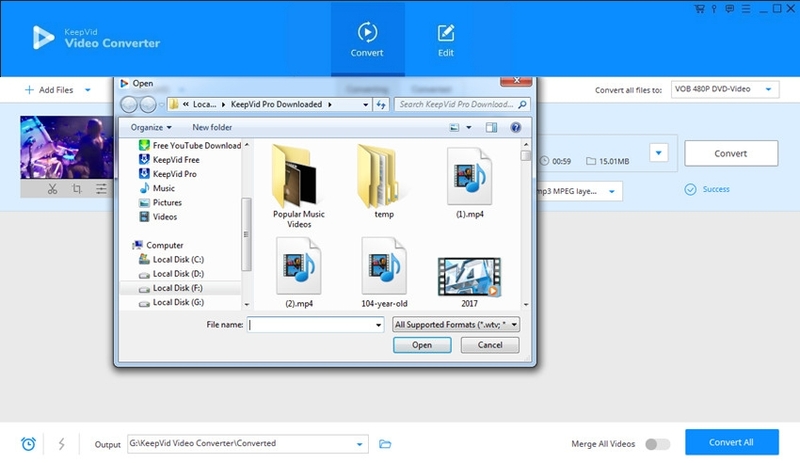 Start KeepVid Video Converter and add AVI video into the program. Step 2. Select MPEG as the output format, and click the Convert button. Step 3. When the conversion finishes, you can find the video in Converted tab. First of all, you have to download and install program on your system, then start it and choose the Convert section. After that, click the Add File or Add Folder button at the upper left corner to add AVI files into the program. Or you can drag and drop the file into the program directly. KeepVid Video Converter will display the detailed information of the video. Now you can click the inverted triangle icon at the right side of the Target area, and select MPEG as the output format. Or you can click the inverted triangle at the right side of the Convert all files to button, and choose MPEG as output in the pop-up window. Click Convert or Convert All button to start converting AVI to MPEG. The program will display the process of the conversion. When the conversion finishes, you’ll get the converted file in Converted tab. You can also right-click the video and choose Open File Location to find the video in your computer. When the conversion finishes, you can turn to Converted tab and locate your converted video. And you can right-click the video and choose Open File Location to find the video in your computer. • Please pay attention to the size and quality of the output file before conversion. Sometimes the output file will be larger than the source file. • Keep an eye on the video conversion, as the compression of the video may lead to the lower quality of video. • Instead of converting videos one by one, you can convert multiple videos with the Batch convert feature. • Alternatively, you're able to convert MPEG to AVI with the help of the online and desktop methods. In this part, we're going to show you the top AVI to MPEG online and desktop video converters. KeepVid Online Video Converter is the newly developed but very powerful online video converter website and enables you to convert AVI to MPEG format very easily. This website totally works online without any third-party software installation. There are 50 video and audio formats supported by this online video converter website, and almost all popular formats are covered. Online Convert, as the name indicates, unveils the function of this website. It supports mostly all types of files and format to convert in other formats. When you visit the homepage of this website you will find nearly 7 types of converter categories such as video, audio, document, etc. To convert AVI to MPEG you only need to select the video category and then browse the files from your desktop or from Internet by adding URL of video. WinX HD Video Converter Deluxe is a desktop program just like KeepVid Video Converter. This converter program enables you to convert AVI to MPEG and other 410 formats. You can also download videos using this program in different formats from online video sites. There is a built-in video editor available which helps you to personalize videos according to your devices and system need.